Amritsar is one of the most fascinating cities cities in the subcontinent. Not only is it the location for the holiest shrine of the Sikhs, but an engineering marvel is poised to rise above its streets and thoroughfare. Recently merged contractor UltraFairwood have announced its plans to raise a 3.3km long ‘elevated guideway’ to support a railcar network. Even on paper, the details are superlative. 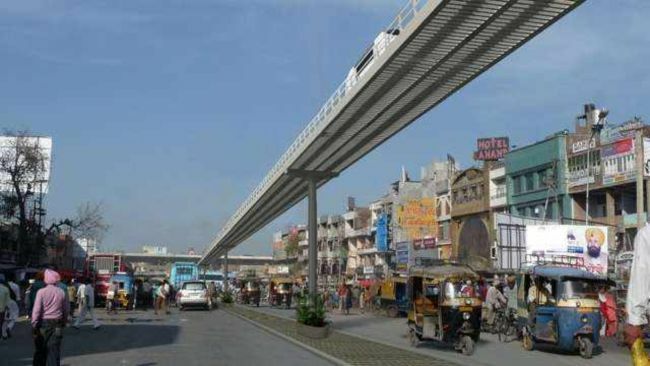 Amritsar represents the first urban application of PRT. At peak capacity the Amritsar system can carry up to 100,000 passengers a day on a 3.3km / 2.0 mile elevated guideway in over 200 pods between seven stations, making it the world’s largest PRT system to date. Financed entirely by private funding on a build, own, operate transfer (BOOT) basis, passenger services will go live in 2014. Although the cost of the scheme is subject to commercial confidentiality, it demonstrates that a large scale urban PRT system can be delivered on a financially viable, fare-based model and offer very real returns for financial backers.